Issue 1: The command line help should be a little bit more descriptive. I had to fiddle a lot to even understand that I had to actually write many options before exporting. Scribblemaniac also mentioned there were some elements missing as well which were already working but not documented. Issue 2: There is a slight readability problem on windows since the CLI help appears on a dialog, so the formatting is out of place. 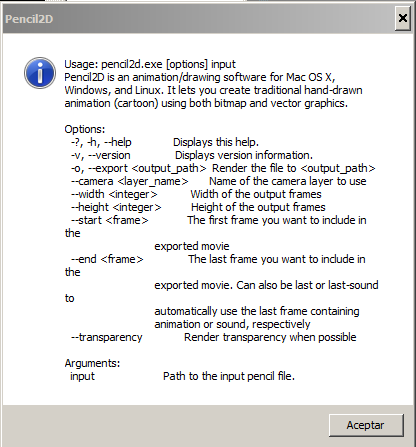 Issue 3: When rendering a file we should see an export bar (or a percentage increment from 0 to 100%) , either on the console or as a dialog if possible, otherwise it's a bit unruly to know when Pencil2D has finished rendering. Issue 4: After a lot of testing I've definitely noticed that exporting from Pencil2D editor ironically now uses LESS memory than when you use the command line rendering, which should not happen as the editor is only opened to track the file (from what I saw). Perhaps the active frame pool form the preferences is not being taken into account? does command line rendering not use the active pool or perhaps we have to set it as an "option" as well on the command? pencil2d.exe --export "C:\PATH\cmd_export_test_.mp4" --camera "Camera Layer" --width 800 --height 600 --start 1 --end 1112 "C:\PATH\0.6.2.1_active_pool_moved.pcl"
*PATH is meant to represent a full file path. These were apparently the minimum amount of options I had to input before a successful render, but notice that I had to define: Which camera layer was being rendered (I had only one, might be more useful having more camera layers, but should default to render the first-index camera), I had to define the export size (which is the camera size), the start and end frame (which should be defined by the last keyframe container).